If you are searching for cooling tower maintenance tips, this post should help. Cooling Tower Products is the largest supplier of cooling tower parts and products and can help you to keep your cooling tower in perfect working order. Through regular use, a cooling tower that has been neglected means its leaving water temperature will increase. This raises the cost of energy up to 6% for every 2 degrees Fahrenheit of increase. Conversely, a cooling tower that has been regularly serviced and maintained will continue to function at the original level of optimum performance helping to keep the costs of energy as low as possible. The following cooling tower maintenance tips are simple and can help you save up to 15% on the costs of electricity. As well as conserving water, a regular maintenance routine also extends the functional life of cooling equipment and ensure you get the maximum performance possible from your cooling towers. Inspect the unit and having listened to it, take note of any noises that seem unusual to use as a baseline for any potential issues that may arise. Follow the recommended and proper lock out procedures and disconnect motor switches before the commencement of any hands-on work. This is to ensure your safety. Having made an inspection of the strainers cleaning debris from them will help to maintain excess materials from infiltrating the system. Conduct an inspection of the water distribution system and check for dry areas over the fill coil section to increase system capacity by avoiding scale build up.If the surface is not fully wetted, check the nozzles for clogs and cracks. Flush debris and dirt through the sump strainer or tower drain from the cold water basin to keep dirt from accumulating and to ensure maintenance of water filtration. Find the appropriate predetermined water level by checking the makeup water supply. This will reduce air entrainment and conserves water. As per the evaporation and local water quality regulations where you live, adjust the bleed rate to prevent the accumulation of solid mater in what that is being recirculated. Optimal performance of the belt drive system is reliant upon any tension problems being properly addressed and fixed. Always follow the manufacturers recommendations for assuring reliable service by routinely checking the oil quantity, oil level and shaft alignment for a gear drive system. Every three months at a minimum, lubricate the bearings of fan shafts to ensure proper operation. You can eliminate the need for monthly bearing maintenance with the installation of bearing greasers that are automatic. This is an easy task to perform. Frequency of maintenance does vary depending on the circulating water condition and the environment in which the unit operates. If you practice the habits of good maintenance you will not only extend the life of your equipment but also help to prevent the failure of equipment. If you also want to reduce downtime further in the event of an emergency where you cannot afford a stoppage, continue storing critical parts in inventory so they are at hand when you need them the most. Hopefully these tips will save you energy, time and money and assist you in getting the most value from your cooling equipment. 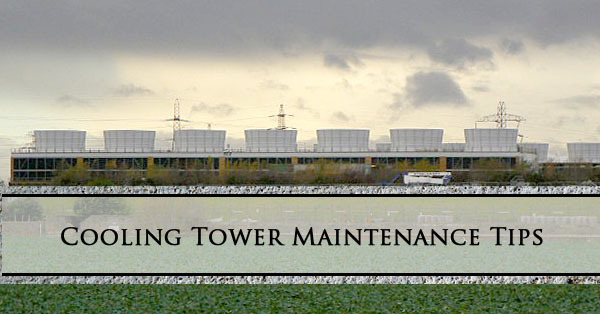 Looking For Cooling Tower Maintenance? Cooling Tower Products has over 4 decades of experience with cooling tower maintenance and can help you with any cooling tower related project. Contact us today and get the professionals at Cooling Tower products on your side.